One problem I have when I want to cultivate a good habit is that I get super-excited and make things way too complicated. I draw up a spectacularly elaborate plan that is doomed to fail – I only say that last part BECAUSE THAT’S WHAT ALWAYS HAPPENS. Depending on your season and station in life, you will need to cultivate a morning prayer routine that works for you. You might be a stay-at-home-Mom with little ones underfoot and a foggy memory of what praying actually looks like🤔. Or you could a high-powered attorney who works early and stays late, who can barely make it through the Our Father without nodding off 😴. You may have four young kids and work outside the home🤯. Or perhaps you are retired, all the kids are adults, and you spend your days knitting beautiful crafts for your grandchildren and walking in your garden.🌸. The point is that everyone’s prayer routine will look different – even if we fall into the same category – because everyone has different temperaments and different needs. I am a high-school teacher who works like crazy during the school year 🤬 with a blessed respite in the summers😎. My husband and I are currently a “Waiting Family” for adoption – and so we are “child-free” for the moment. (Side Note: That’s the new way to say “child-less” which can be a tough term for those who are dealing with fertility issues and/or wanted children but never had them. But I digress). More on the adoption front in a future post. As a teacher, I wake up earlier than the common horde and because my vanity requires at least an hour for hair and make up, I need prayers that are meaningful and short. Emphasis on short. But they have to be meaningful! I have tried some beautiful prayers, full of meaning for me… but I had to get my hair and face started or I’d be late for Homeroom. If this sounds like you, try to find a meaningful, short prayer that you say between the time you wake up and before you get to work. Here is my current routine which can help you get started. Take what you like and leave the rest. 💠Mostly: I say my morning prayers right after I watch a little morning news (Morning Joe) and eat my cereal (Special K Chocolate Almond) before I step in front of the mirror for hair and make-up. 💠Occasionally: I say my prayers on my walk to Starbucks or Dunkin’ Donuts. Because I forgot to say them before hair and make-up. (And for those keeping count: Yes, for my iced coffee which is a completely different drink than my earlier hot coffee). 💠You know yourself best: Some of you will need to say the prayer upon waking, some will need coffee first, some will say it in the car or train on the to way to work… For those working in the home, you might say it while feeding the babes. In his book, Plan of Life: Habits to Help You Grow Closer to God, Roger J. Landry suggests that morning prayer can be done at any of these times. Some will do it upon rising, others after a cup of coffee and a shower. I rejoiced when he said that because I used to think morning prayer MUST BE SAID IMMEDIATELY UPON RISING. And I didn’t even have a chance to fail at that regimen because it never happened in the first place. You can find Landry’s book here. 💠Experiment! And see what sticks. Here are the prayers I am currently using for my morning prayer (at least on weekdays). It’s right there in the name! There are many versions and you can google it to find the right one for you. I use this traditional Catholic version. I have this visual saved on my phone because if something is pretty, I am more likely to use it. Printable Prayers by Kendra Tierney. Can be found here. Full disclosure – I belong to a couple 12 Step Groups. These two prayers currently resonate with me. I always shied away from this prayer in the past – too militant for me. And I didn’t like thinking about the devil or evil spirits because I felt like it set me up to be suspicious of others. 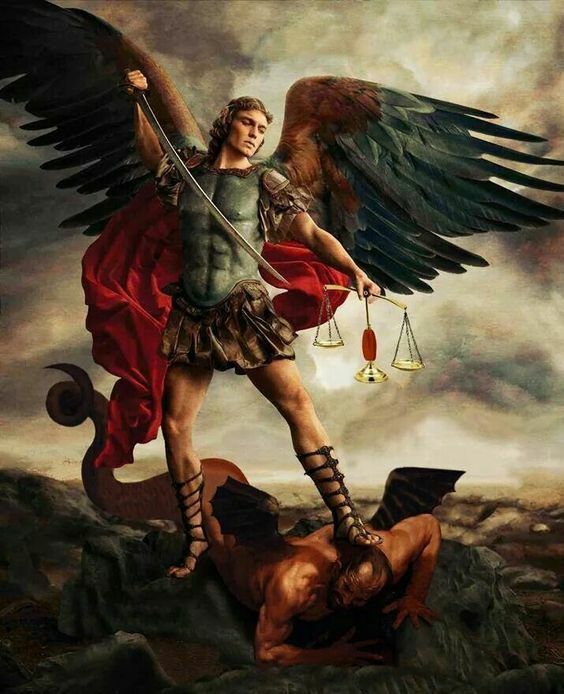 But, like most things in my Catholic journey, St Michael showed up when I needed him most – when forces beyond my control were causing me serious anxiety. I was spinning out! Then I thought: Huh, maybe Saint Michael can fight this one for me… So I went on Pinterest to download an image of him for my phone. I like the ones that show him as strong and peaceful. At the same time, I came across St Joan of Arc in her battle regalia and downloaded that as well. I’m super visual so these images helped relieve some anxiety just by looking at them. 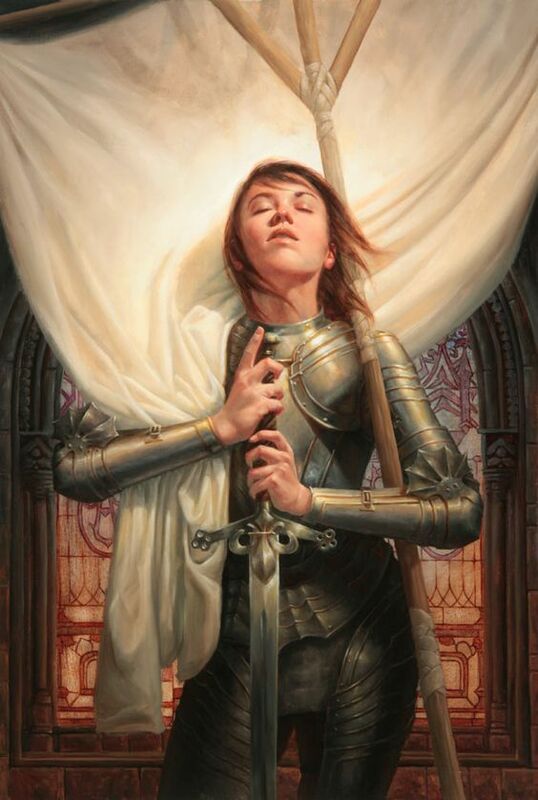 St Joan of Arc, praying. In full battle gear. What is your current morning prayer routine? What have you tried in the past that worked or didn’t work? What struggles are you currently facing? I would love to hear from you. Please comment in the section below. Awesome blog. I don’t have a specific morning prayer, but I do have my daily conversation with God in the morning and after all that is form of prayer. Yet, now you have inspired me to look up morning prayers because there are so many great ones. Although, my daily conversations with God whether morning, day, or night will never fail. My faith in God is true a gift, just knowing that there is a power that exists all loving, understanding, and forgiving gives me hope, serenity, and happiness each day. Reading your blog this morning was my morning prayer of the day. Thank you, Skye! Keep on posting 😘.